Steelhead Fishing Guided Trips — Bent Rods Guiding & Fishing Co. The elusive and highly sought after Steelhead. Considered the greatest sport fish to chase in the world, Bent Rods will give you their best lessons, locations and tips for catching this chrome, sea-run fish. 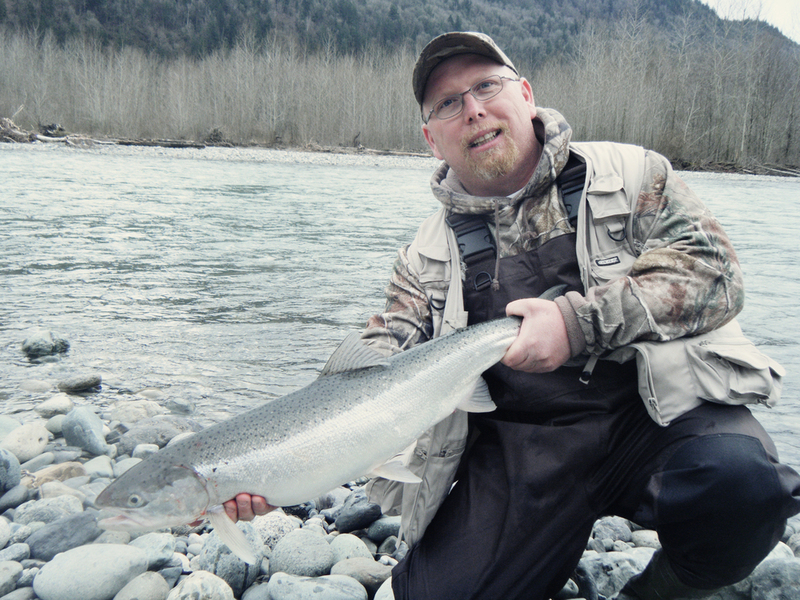 Without a doubt- the premier sport fish of British Columbia is the Steelhead. Steelhead are the ocean going cousin of the Rainbow Trout. They maintain all characteristics of their freshwater relatives, and can only be distinguished by the act of traveling to the ocean to grow and feed before returning to their natal stream to spawn. Although the Steelhead is not a Salmon, their life history and characteristics that apply to angling closely resemble that of the Atlantic Salmon. As with Atlantic Salmon, Steelhead sometimes make the trip from river to sea numerous times. Many of these return spawners have legendary size and strength. 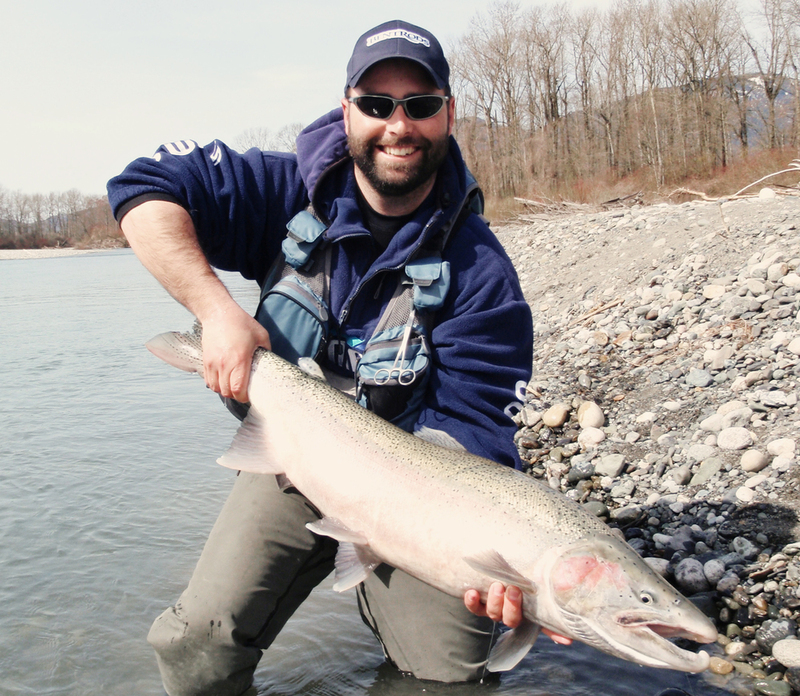 There are two types of Steelhead that return to the rivers of southern British Columbia. The Summer run Steelhead can make it’s return starting in June, with some strains returning as late as December to the more interior rivers of the Fraser watershed. Summer runs are noted for their aggressive behavior towards all an angler has to offer, and the strong acrobatic fight that ensues. The summer Steelhead returns to the rivers far from sexually mature, and will often hold in the river as long as 12 months before spawning. This makes them a very willing biter, with most anglers believing that they do indeed feed while awaiting spring spawning. The other Steelhead that returns to our rivers is the Winter Steelhead. These fish start arriving in late November and continue to appear until spring freshet floods the rivers in May. Winter Steelhead arrive silver and beautiful with clear fins and black backs. These are one of the most beautiful Salmonids to swim our rivers. The Winter Steelhead typically arrives quite ready to spawn and much more sexually mature than its summer cousins. Females often sport plump bellies full of eggs, and males are quick to form colored sides and kyped beaks, as spawning is just weeks to a few months away. As the Winter Steelhead arrives during the river’s coldest months, they can be more difficult to catch as far as the angler is concerned. To illicit a strike from these magnificent fish, the Winter Steelhead demands a good presentation placed close to them, due to their lowered metabolism. 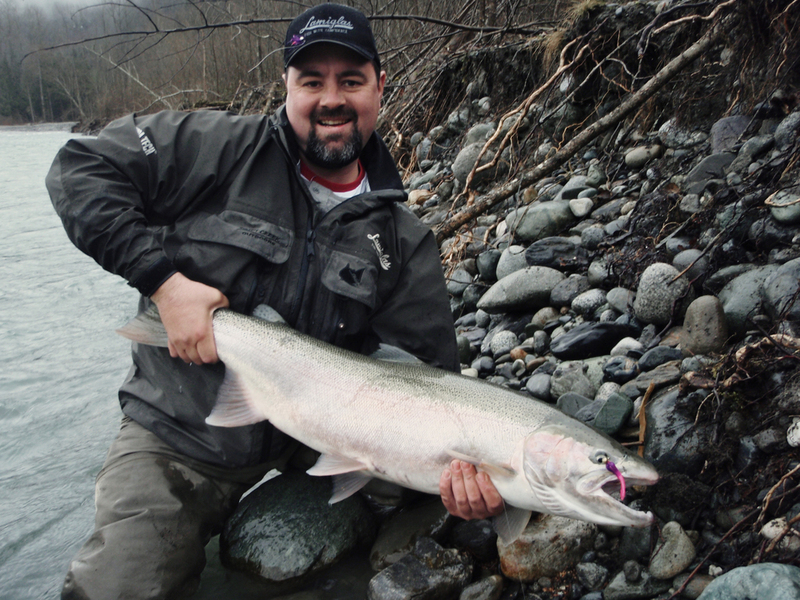 Bent Rods Guiding is very committed to angling for Steelhead. 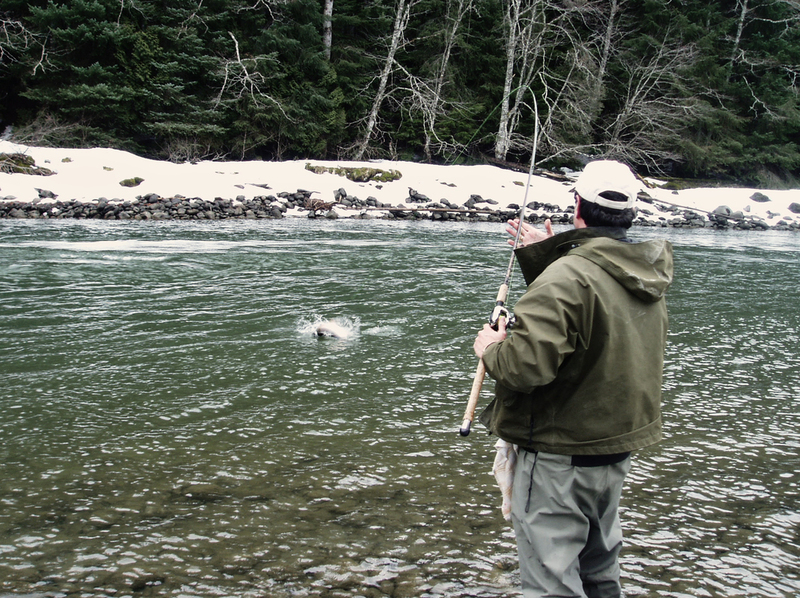 Our guides fish for Steelhead year round both while guiding and in our spare time. Aside from this, we do volunteer work for the Fresh Water Fisheries branch. We capture live Steelhead to be used for wild broodstock hatchery programs which provides future angling for these stunning fish. 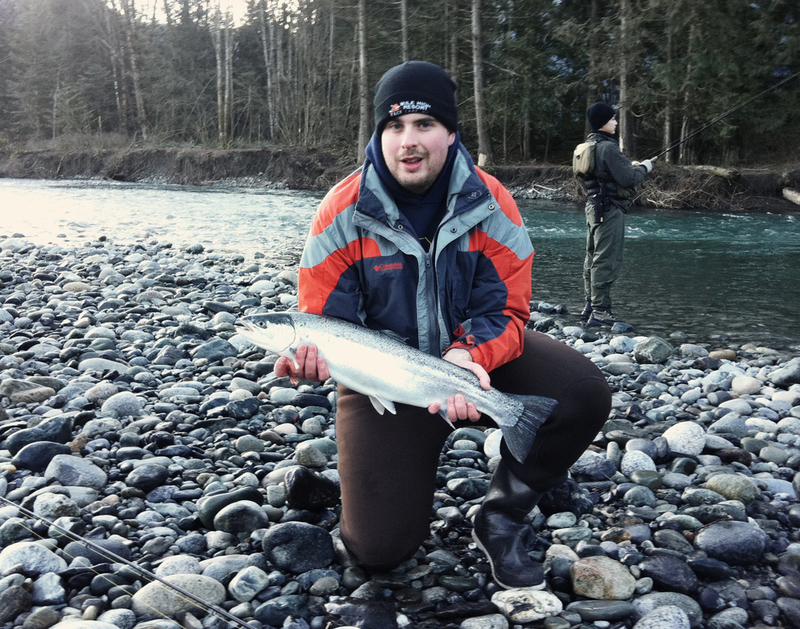 Starting in late January we provide fishing trips for the beautiful Winter Steelhead, on a handful of local Fraser Valley rivers. Whether you are interested in a one day trip to help hone your skills at reading water and presenting various lures and baits- or a week long vacation of visiting numerous watersheds and sampling some of the great rivers in the Fraser Valley, Bent Rods can provide you with the trip of a lifetime! Catching a Steelhead during a walk n wade is not guaranteed. Steelhead fishing trips are largely aimed at helping the angler cut their learning curve and get into fish! We can provide waders for sizes SMALL to XXL, and wading boots for size 8 (reg. shoe size 7) to 13 (reg. shoe size 12). For all sizes outside of this range, you will be required to have your own waders and boots. 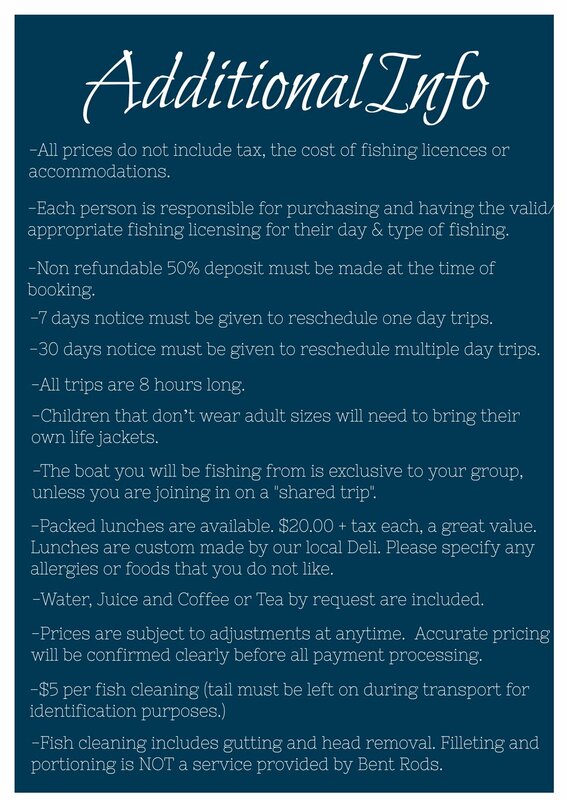 If you would like to book your trip, fill out the form below and we'll get working on getting you on the river with a rod in your hand.